The Unfathomless Series continues to be the best ongoing series in the field recording industry, as proven by new entries from Flavien Gillié and Vanessa Rossetto. The sounds are always intriguing and the unified presentation ~ featuring art by Daniel Crokaert ~ contributes a memorable visual identity. They paved paradise and put up a parking lot. These lyrics, penned decades past, lamented the destruction of nature for commerce. But what happened next? Flavien Gillié attempts to answer this question with the single-track Nonante-neuf fragments harenois (roughly translated 99 fragments of sound from Haren). This Brussels community became industrialized, but then the industry left: factories razed, airport deserted. While walking through the ruins of this area, one can sense the sedimentary weight of history, which no longer seems like progress. And yet its future is already written: a new “mega prison” will soon open, and the local gardens will be restored, an unusual, if not heartbreaking combination. Like many artists before him, Gillié sets out to preserve a record of his sonic environment. But like few artists before him, he realizes that the sonic clock has almost struck midnight. This lends the project a strange melancholic air. To whom might dilapidated industry appeal? Compare this, perhaps, to the wreckage of a relationship, which possesses its own sullen allure. His recording is beautiful: peaceful as the wind, the quiet rustle of tattered paper, the hum of lonely generators. 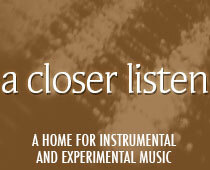 Mid-composition, the drones grow more insistent, while respecting the distance of the listener. When they recede, birdsong enters, as tentative as an exile returning home. In the end, creaks and clanks lead to the sound of a slow, slow, rail, a town beginning to re-awaken. But to what? The next chapter remains unwritten. As much as Gillié’s soundscape is inspired by the external, Vanessa Rossetto’s is inspired by the internal: specifically, the artist’s state of mind during a visit to New York City. Her poetic description of the process is akin to a diary entry and is well worth reading. During her stay, she attempted to record every minute, and afterward to “wind bits of straw into something resembling a form.” But as this time coincided with a severe bout of depression, she chose to concentrate not on the obvious sounds, but the sounds in-between; the seemingly mundane, unimportant, fragmented or abandoned pieces of sonic debris that rested between the lead sonic stories. Those who have struggled with depression understand this approach, as the big things are often too much, and the little things, seen and heard in macro, may be just enough. In this case, it means crackle and chirp, honk and holler, turnstile and ticket machine. Turn it up and it’s overwhelming, a fugue of amplified fury. Courtesy to A Closer Listen for the reblog.